With packed snow covering a large portion of the three-loop winter course, the track was arguably better than has been for the past few weeks. The snow storm that hit the Twin Cities later in the day, however, will likely cause that to change. 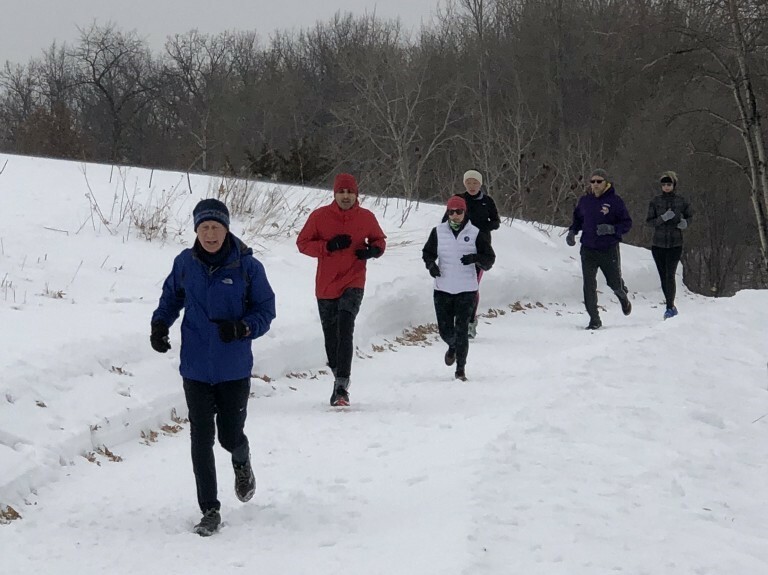 In anticipation of thawing and freezing snow over the next few weeks, it would definitely be a good idea to check the Eagan parkrun website (www.parkrun.us/eagan) and social media for cancellations each Saturday morning before you make the journey to Thomas Lake. We will do our best to have any cancellations posted as early as possible on Saturday mornings. We welcomed at least five* first-time parkrunners today, bringing our historical total of individual finishers to 979. One particular standout was Rita Johnson (below in black stocking cap), who deserves special recognition, and truly epitomizes what parkrun is all about. Her husband was overheard saying that today's event was Rita's "first." When asked if it was her first parkrun, or her first 5K, he simply said, "It's her first anything!" 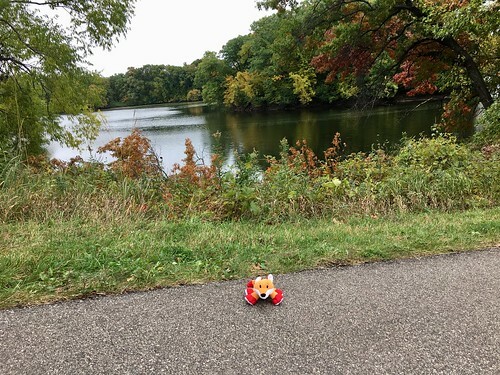 Apparently, Rita has been secretly training on her own for a while, and this week she was ready to knock out her first 5k. 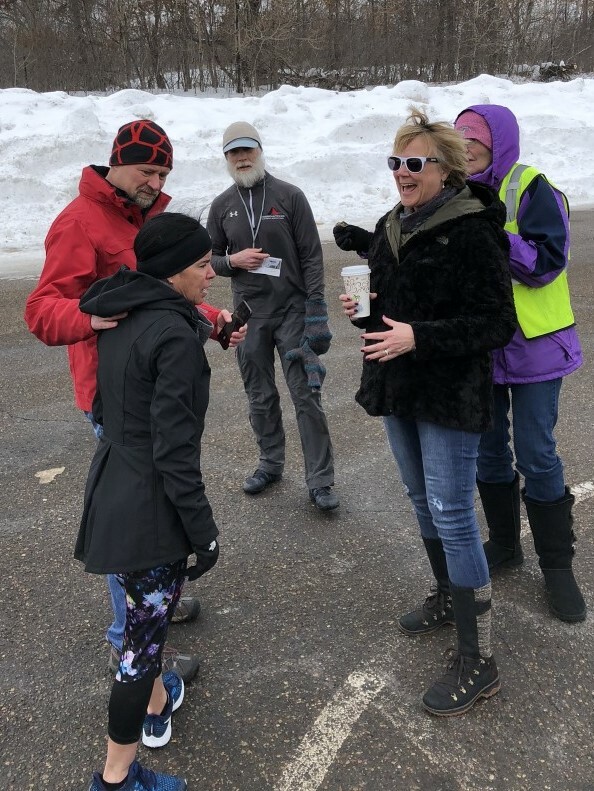 She had plenty of support on hand as well, not only from her husband and carload of friends, but from everyone present at the finish line when she crossed. In fact, her finish might have been the loudest ever at Thomas Lake to date! Congratulations are definitely in order. We truly hope you return soon, Rita! We promise Spring will get here...eventually! 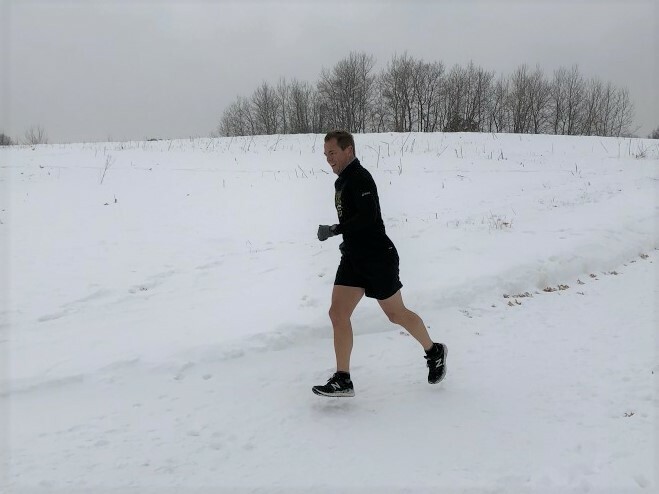 With a little better snow pack on the course, and no stroller this time, Joe McCauley was back for his second parkrun at Thomas Lake. Under these improved conditions, Joe managed to shave a whopping 16:14 off of his debut time from just a few weeks ago. Also back for a second go at it was junior parkrunner John Lutterman (JM 11-14), who took a pre-event loop around the course with Dad (first finisher and barcode scanner Mark Lutterman) (above center) to warm up and inspect the course. John also achieved a parkrun PB, despite the strong winds and insane wind chill. 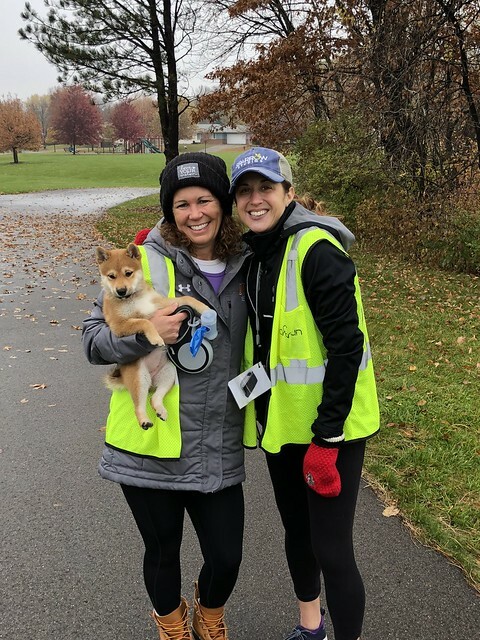 We can't wait to see what both of these parkrunners are capable of this Spring when course conditions are even more favorable. As always, a BIG THANKS to our volunteers this week: Nate Damro (course setup and timekeeper), Mark Lutterman (barcode scanner), Nancy Wilson (finish tokens), and Ed Anderson (tail runner and post-event clean-up). *There may have actually been 6 first-timers today, but we are not sure. Our 18th finisher did not scan her finish token, so the mystery remains! 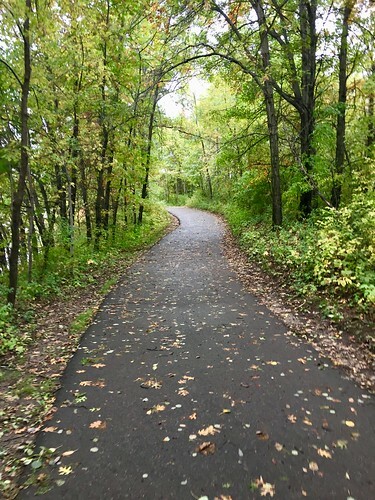 If you are our mystery parkrunner, please send us an e-mail at eaganoffice@parkrun.com and let us know, so that we can add you to the results for Eagan parkrun #90! Also, if you happen to find the #18 finish token in your pocket, we would be elated to get it back! No questions asked! Keep warm everyone. Happy running! parkrun 87 is in the books and all 14 runners and 7 volunteers are now thawing out. 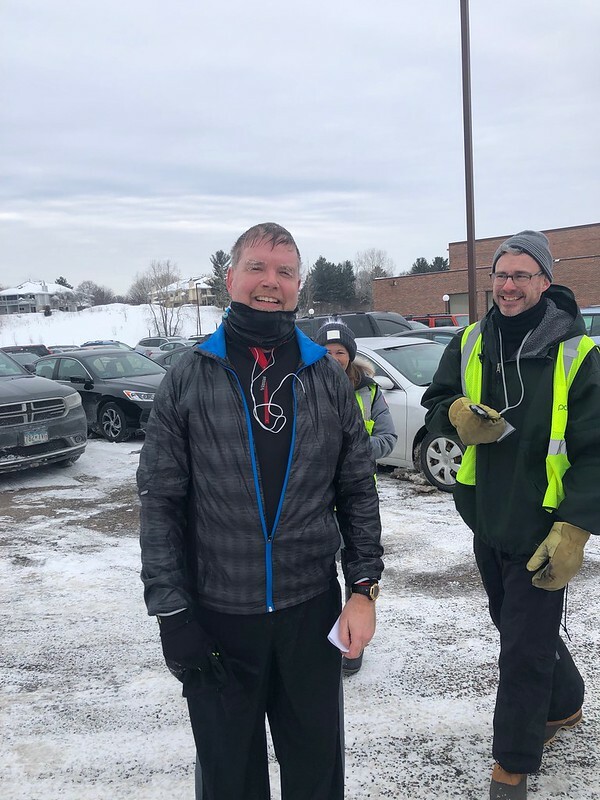 We had one first timer from Bloomington, Jim Gonnella who decided that the perfect first parkrun was when it was 2 degrees! We promise its warmer in the coming months, but for today Jim earned some frozen eyebrows! Jim Leffelman and son Mike enjoyed the tropical temps as Mike completed his 10th parkrun! And congrats to Francine LePage who completed her 75th parkrun this week! Another great morning for a run and this parkrun had a group theme. 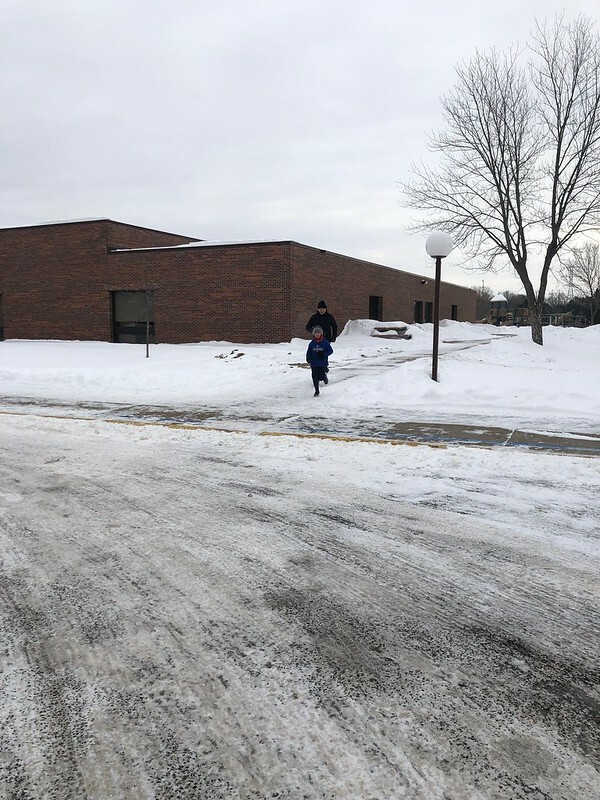 All the way from Australia, the Australian Broomball Team was in Minnesota for a tournament in Blaine and stopped by to get a quick warmup before hitting the ice. 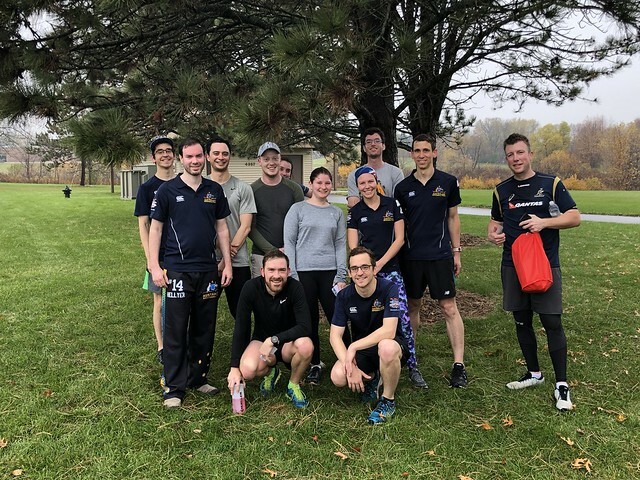 They are joined in this picture by another visitor Josh from Australia who just happened to pick today to come to Eagan parkrun. Thanks for coming out! We also had Faculty members from the nearby Oak Ridge Elementary School who hit the trails and had a blast. Thanks for coming out ladies of Oak Ridge on the Move! Thanks again to our fantastic volunteers, we could not do parkrun without you! (Literally this time as Naveen showed up and helped keep some of us from trying to do two things at once!) Thank you to Steven COX, Melissa DAMRO, Michelle HORN, Scott HORN, Naveen KUMAR, Anita PAGEY, and Nancy WILSON. Great morning for a post-Thanksgiving run to burn off some of that pie! The rain overnight went away just in time for our 35 runners to enjoy very mild conditions. (Hey, its almost winter in Minnesota.) 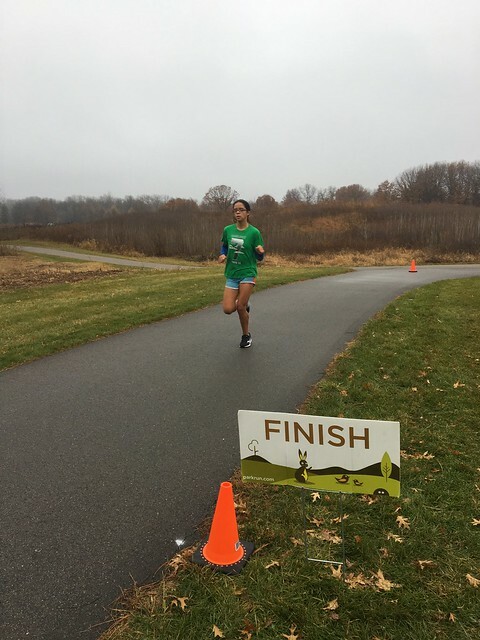 We welcomed back some stalwarts of our Eagan parkrun family and it was all lead by Daisy Islas who not only was our first finisher but also posted a PB! 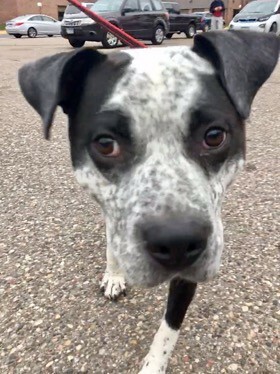 Great job Daisy! In fact, Daisy started a trend as our first four finishers and seven runners overall bested their times. Congrats to Adam Burnett, Beth Claybaugh, Joshua Picotta, Isiah Picotta, Hayley Bujalski, and Tad Dolphay for their PB's. We also had some first timers, including Michael Picotta and Samantha Damro, youngest child of Eagan parkrun founders Nate and Melissa. Great job Sammy! 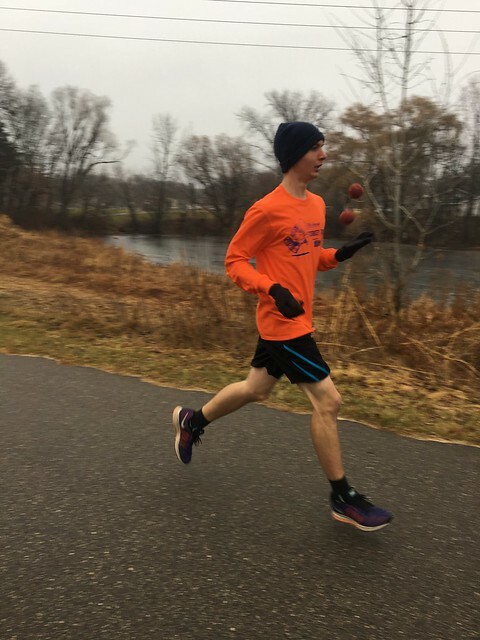 To keep things exciting (as if a PB wasn't enough), Josh Picotta ran the course while juggling, never breaking stride! Thanks to our outstanding volunteers, Scott, Michelle and Sophie Horn, Tom "Turkey" Anderson, Francine LePage, Linda Kaye, Skip Schaeffer and Naveen Kumar. 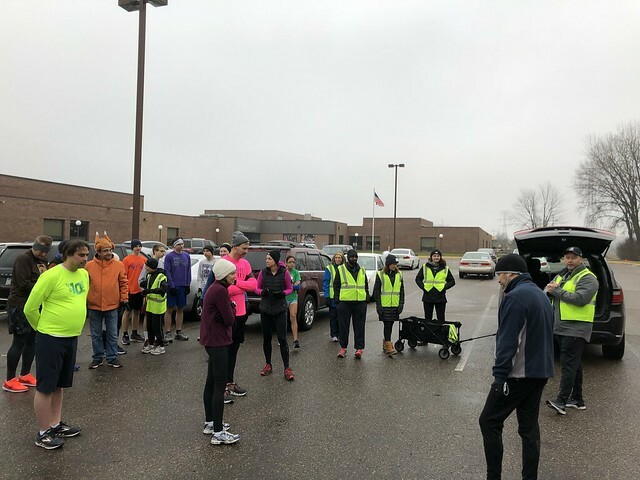 The saying “Minnesota Nice” is a very fitting description of the community at Eagan parkrun. As a touristing parkrunner based at Roosevelt Island parkrun in the DC-area (with roots in Florida! 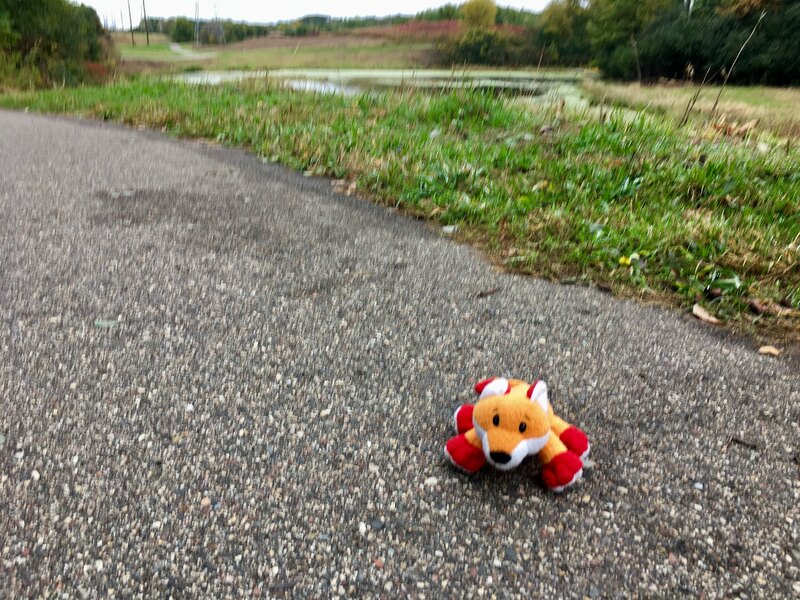 ), the chill in the air in early October caught me more off-guard than I care to admit, but the spirit at parkrun never fails to warm the heart. The hot coffee before and after didn't hurt either! At event #72, Run Director Andy welcomed all-comers and made the announcements while barkrunner Gus serenaded eagerly in the background. A few minutes later, we were off to explore the peaceful, meandering course. The overcast sky created a beautiful contrast to the bright colors of the leaves, which were starting to transition to their autumnal glory. While we were walking, many other parkrunners were pushing hard to the line. 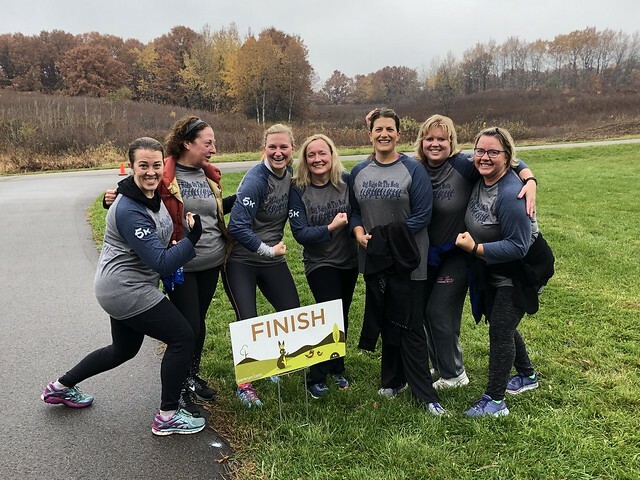 Congrats to all the parkrunners who achieved a personal best: Mark Lutterman, Michael Groskreutz, Christopher Prokop, Caitlin McMahon, Jordan Bowen, Francine Lepage, Melissa Howland, and Molly Hapgood. 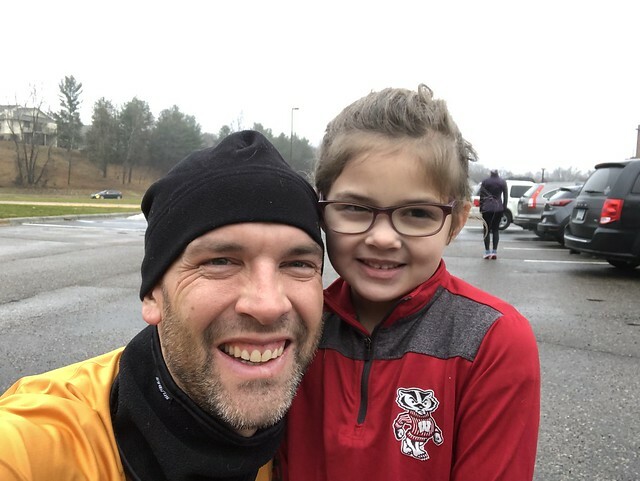 And, a great big welcome to the parkrun family for first-timers Michael Haring and Brooke Paquette. We hope you had a fabulous time and join us again! Many heartfelt thanks to this week’s volunteers: Andy Borne, Seth Borne, Jacob Damro, Carol Ferrazzo, Tammy Fluto, Naveen Kumar (who hit volunteer milestone #10 today! ), and Nick Rogers. We couldn’t have parkrun today without your awesome support!